To sling mud or not? For political candidates and their campaign surrogates in the overheated midterm elections of 2018, that’s the question. Is it worth it for a candidate to hitch their wagon to negative attack ads? Are social scientists correct in saying that voters might say they abhor negativity, but are biologically rigged to pay more attention to negative messages? Or will they be in the minority and take the high road to emphasize their position on issues and tell their personal story as so many newly minted political candidates, like Texas congressional candidate MJ Hegar, are doing this year. While candidates are weighing the pros and cons, commercial brands that are advertising in this election season have some questions to ask and answer of their own. The primary one is whether they’ve carefully considered the impact that all this negative advertising will have on their brand’s reputation. If your ad follows a political mud-slinger, does some of the mud land on you? Does Negative Political Advertising Hurt Your Brand? It is a question that has been hotly debated in hotel bars at marketing and advertising conventions around the country for decades. It started in 1964 when Lyndon Johnson attacked Barry Goldwater in a TV commercial titled Miss Daisy, the first recorded attack TV ad in American politics. Campaign operatives were terrified the ad would backfire, but it was widely credited with effectively painting Goldwater as a warmonger and appealing to a public fear of nuclear war. Twenty-five years later, the J. Walter Thompson agency confirmed Kroll’s opinion, issuing a report that brand advertising was viewed as 32 percent less relevant when it aired following a negative political ad. Based on responses from 3600 survey participants, the report found that viewers suffered a negative “hangover effect” after viewing a negative political ad and it carried over to any subsequent advertising they viewed. The logic was akin to the good seed/bad seed sibling comparison. Negative advertising was so repulsive to viewers, the researchers concluded, that product advertising looked great in comparison and therefore elicited a positive response. The fact of the matter is that we humans are drawn to conflict. Negativity is an attention-grabber, and all advertisers want those eyes and ears. Borrell Associates, a research and consulting firm that tracks local advertising, forecasts that at the national, state and local levels political ad spending will reach a staggering $8.5 billion. Who are the big winners? Broadcast TV will rake in $3.3 billion, while digital media will continue on its dizzying meteoric pace, taking in $1.8 billion. Digital advertising is clearly changing the game, both for political candidates and companies advertising during the election season. In addition to the possibility that a candidate’s ad goes viral and produces off-the-charts ROI, unlike TV, digital advertising also offers unlimited access. That allows campaigns the time to develop a cohesive model and get it out in front of voters in targeted ways. That’s a distinct advantage over broadcast and cable TV. In fact, to judge the importance of the digital platform in modern day American politics, look no further than who was selected to run President Trump’s 2020 campaign. Originally hired by the Trump Organization to build websites, Brad Parscale was Trump’s 2016 digital campaign manager and is widely credited with being the X-factor in his victory. TV, on the other hand, doesn’t have the wide-open frontiers of the digital platforms. It’s still the medium of choice for most candidates, however. But we’re a long time removed from Dwight Eisenhower’s 1952 ad Eisenhower Answers America, which is the first political ad run on broadcast TV. If you’re based in a hotly contested district, it’s non-stop political ads now; an endless cycle of finger-pointing, backbiting and candidates posing with smiling children. Think of TV’s limited time slots in the midst of an election cycle as a crowded subway platform with a train entering the station. It’s all push and pull, jostle and elbow. Especially at rush hour. There are only so many seats available. Given that federal law mandates that TV stations offer federal candidates their lowest rate for a time period, campaigns can lock in at discounted rates if they sign up early. But political campaigns tend to adjust on the fly, which means that the closer to an election it gets, the more expensive ad slots become. In heavily contested races that might mean missing out on a valuable time slot altogether. Candidates nearing the finish line are hardly the only ones to feel the pinch of limited inventory. An analysis of the 2014 midterm found that car dealers were impacted appreciably by a dearth of open TV ad slots. They ran up to 50 percent less ads than normal in peak hours and saw a resultant drop in sales. Retail, professional services, medical services, and other businesses saw a 30- to 40-percent drop in their ads as well. We’ll know more about what’s working best in just a few days. 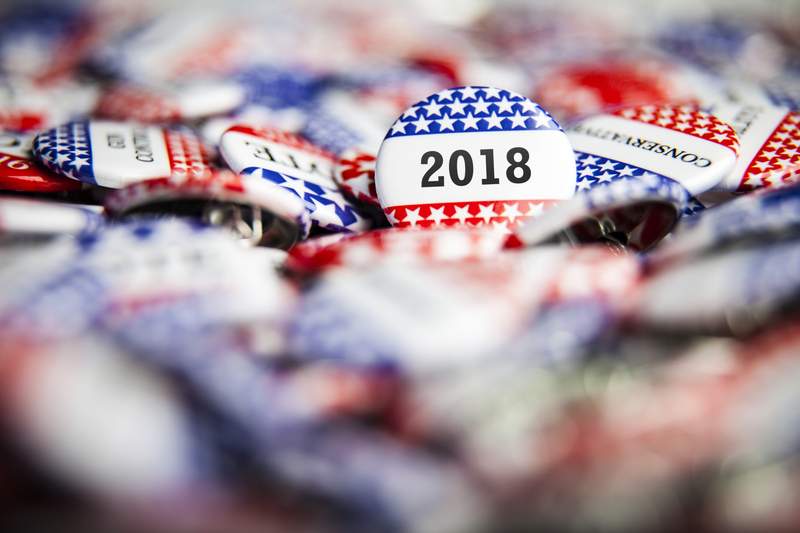 After election, fatigue wears off and analysts get to work digging through the data, these midterms should offer up a goldmine of information to inform future campaigns and companies considering how to align their brand in the next election cycle.